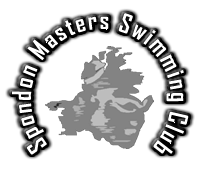 Spondon Masters swimming club, a friendly swim club for adults of all abilities. Based at the Lonsdale Pool Mickleover Derby. An affiliated member of the Amateur Swimming Association. The club has been in existence for over 40 years, but recently has concentrated on the adult swimmer giving advice and support to all members to achieve their own personal goals, whether a fitness swimmer, or a competitor in Triathlon , Open Water Swimming, or Masters swimming our experienced coach is on hand to give advice and tips on technique, with their own personal programme. A chance to swim up to 3 times a week with a group of friendly adults, make new friends and keep fit at the same time. "I had a very friendly welcome when I went along on a training night and swam in the session straight away. Swimming with only 2-3 per lane and a personal training programme have been really beneficial. The training times are also excellent." "I won't say it's fun or Mick will increase the distances, but the sessions are really rewarding – it's a great to feel part of a club with something for everyone." We are probably the biggest supplier of printed swimming caps in the UK. We also supply printed drinks bottles. All printing is done 'in-house' so we have full control. We also manufacture & print swimwear, sports bags and poolside clothing. Click on the easyfundraising logo when you shop on line to help raise funds for Spondon Masters Swimming Club. Theres over 600 popular retailers to choose from, it wont cost you anything extra, and it raises money for the club.